This item has been brought to my attention by that dynamic duo, Tommy and Roy, better known as the Alter Boys. Tomorrow they, along with a number of other notable north Brooklyn businesses (like Kill Devil Hill!) will be selling their wares at the Mister Market. The whole shebang kicks off at noon. Why not swing by and see what they’re got cooking? 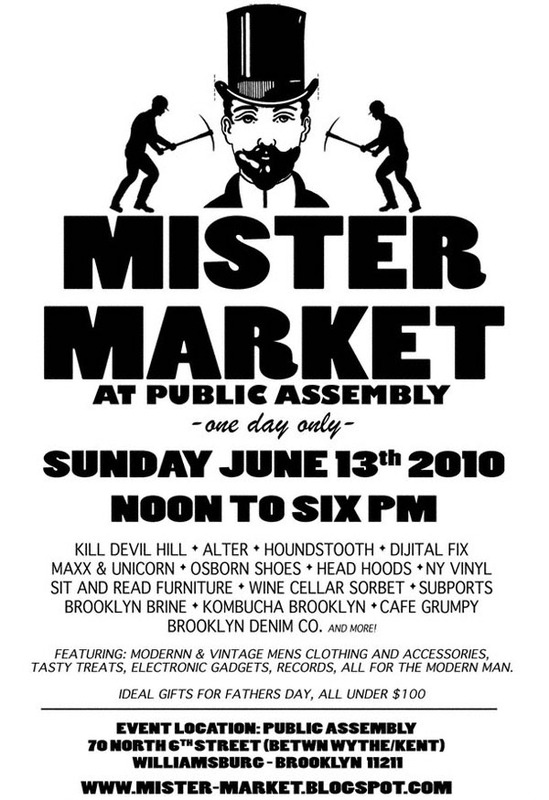 June 13, 2010 12:00 – 6:00 p.m.
You can get more information about this event by checking out Mister Market’s web site. In closing (and on a shameless self-promoting note) I’d like to remind everyone that the “closing reception” for my photography show at Creek & Cave is tomorrow starting at 3:30 p.m. You can get the full 411 by clicking here. P.S. : Lest any of you are wondering why I put “closing reception” in quotation marks it is because I have gotten word that my show has been extended! And somehow “middling reception” does not strike me as being very snappy.